Thirty seconds later, the topic changed in the “Categories”-type game, to women in the Bible. Then it changed again, to clothing brands. With each category, Fiat Days participants paired up with a new teammate, first introducing themselves, and then working together to list as many items in the category before tallying their own individual scores. The ice-breaker session on day one of Fiat Days served a dual purpose: for the 41 young women participants to introduce themselves to one another, and to the consecrated religious and adult chaperones on hand; and to illustrate that each person comes to discernment with their own gifts, knowledge and experience. Fiat Days is an annual discernment retreat for young women, ages 15-25, and hosted by the Office of Vocations of the Diocese of Harrisburg, Pennsylvania. 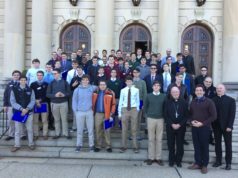 This year, it took place July 1-3 at Mount St. Mary’s Seminary in Emmitsburg. The retreat takes its name from Mary’s “Fiat” to be the mother of our Lord, and offers attendees a time to learn about consecrated life and better discern God’s call. One-third of this year’s participants were previous attendees, and it led to a joyous scenario as long-distance friends reunited in the seminary’s rec room as they arrived July 1. For Zofia, 18, Fiat Days offers good conversation and quality time for discernment among like-minded women her age. 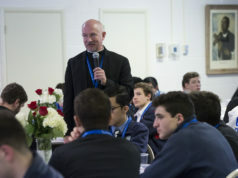 The Fiat Days schedule included daily Mass, adoration of the Blessed Sacrament, spiritual direction and discernment walks with the sisters, the rosary and night prayer, and camaraderie forged through small group discussion, recreation and meals. Consecrated religious at the retreat this year included the Salesian Sisters of St. John Bosco, the Sisters of St. Joseph the Worker, the Servants of the Lord and the Virgin of Matara, a consecrated virgin, a representative of the cloistered Dominican Nuns of the Perpetual Rosary and chaperones. “Fiat Days is a wonderful experience for the young girls, because so many times, the religious aren’t in their schools or even in their parishes, yet their desire for a religious vocation is there,” said Sister Patricia Jean of the Sisters of St. Joseph the Worker, from Walton, Kentucky. “This gives the young women an opportunity to meet religious sisters, and to ask those heart-burning questions, like ‘How will I know?’ and ‘I wonder if …’ Here, they can explore and discern in a relaxed and welcoming environment,” she said. 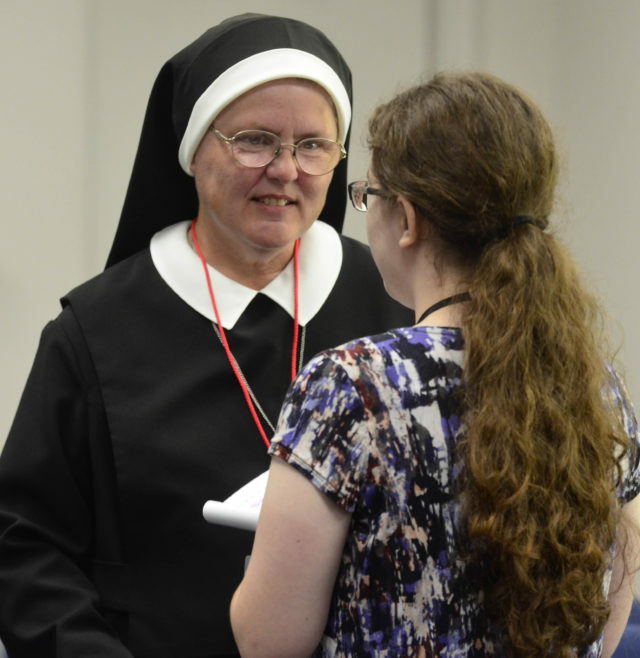 As a three-year attendee of Fiat Days, Sister Patricia Jean encourages the women discerning a religious vocation to further their retreat experiences by visiting religious communities. “If you’re interested in teaching, visit a teaching community. If you’re interested in nursing, go to a nursing community. God will direct you to where he wants you to be. He will fulfill all your desires,” she said.